Fionnuala Britton will face a tough task in attempting to win a third successive Greenmount International Cross Country event on 4 January. 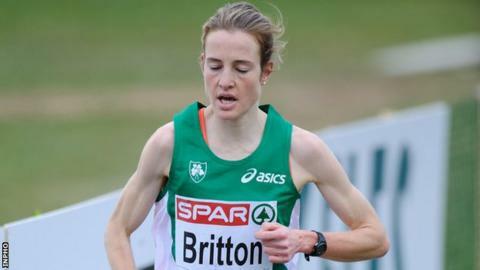 Britton will race in Antrim but so will Gemma Steel and Bahrain's twice world 1500m champion Maryam Jamal. British athlete Steel finished ahead of Britton when taking silver at the European Cross Country on 8 December. Wicklow woman Britton was aiming for three straight European titles in Belgrade but had to settle for fourth. Steel was six seconds ahead of Britton as she took silver behind French winner Sophie Duarte and the duo will probably be the athletes to beat at the Antrim venue. However, the classiest athlete in the race will surely be Jamal, who in addition to her two world outdoor 1500m titles, also took bronze in the metric mile event at the London Olympics. Ethiopian-born Jamal finished behind Turkish duo Asli Cakir and Gamze Bulut in London although Cakir has since faced doping allegations following a drugs test earlier this year. 2011 Greenmount winner Charlotte Purdue also plans to race in Antrim and should be in contention after a solid third place in the Under-23 event at the recent Europeans. Purdue has only returned to action this season after an injury-affected two seasons. Kenyan athletes Magdalene Masai and Eunice Kales have also signed up for the Greenmount meeting after finishing third and fifth last season. Belgian athlete Almensch Belete should also have plenty of motivation on 4 January after a disappointing run at the European Championships. Belete was fancied by many to win a medal in Belgrade but faded to finish sixth some 21 seconds behind Steel and 15 adrift of Britton.